Keep your loyal companion happy with regular grooming. 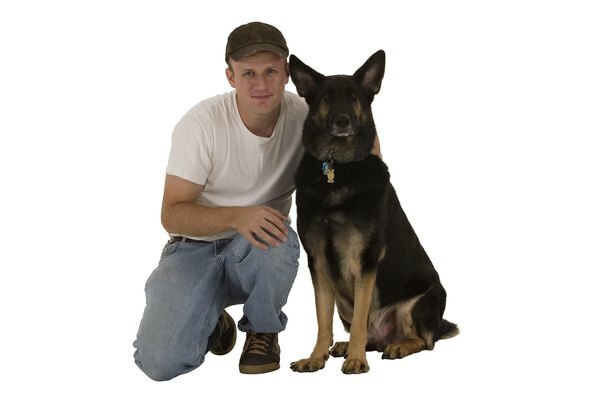 The German shepherd is a fairly low-maintenance breed, compared with a poodle or a Bichon Frise. The German shepherd's active lifestyle, though, does require general grooming and trimming, especially around the pads of his feet. Grooming the hair between a German shepherd’s pads requires a few basic supplies available online or at your local pet store. You'll want to bathe any dog before a trimming, so get a good dog-friendly shampoo. When trimming between the paws, use a pair of blunt-end scissors to prevent nicking your furry friend. Bathing your shepherd before cleaning and trimming the hair around his paws removes any dirt and debris he may have picked up and gives you a clean slate. Wet the pup’s entire coat and add a line of dog shampoo down his back, but avoiding his head. Rub his coat until a lather forms. Rinse him completely until the water runs clear. Blot his thick coat with a clean towel, then either allow him to air-dry or finish drying him with a hair dryer on medium settings. Before trimming the hair on your German shepherd’s feet, have someone help hold him still. Pick up his front foot and inspect it for debris. While holding blunt-end scissors in your dominant hand, trim the long hairs growing between the pads that have grown beyond the pad. Trim between each pad where the V forms on the bottom of the shepherd's foot. Trim around the front pad and between the pup’s toes. Make sure that the hair is level with the pads or shorter after trimming. Work around to each foot until all four are trimmed. A shedding rake used during the spring and fall helps remove the thick undercoat of the German shepherd and helps slow down the heavy shedding. Since the rake reaches down deep, yo'll apply only a small amount of pressure when using it. After bathing the pup, apply a leave-in coat conditioner to add shine. If you don’t have time to bathe your German shepherd before trimming the hair between his paws, use a baby wipe to clean them. If you see cracks in his paws, cover those areas with petroleum jelly or triple antibiotic ointment.